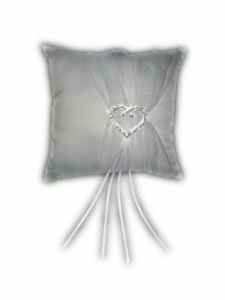 This is a new wedding ring bearer pillow. An organza sash is gathered on the side that is accented with a beautiful Heart rhinestone emblem to give it a stunning SPARKLE. Pillow measures approximately 8"x 8". There is a ribbon strap sewn across the back to help your ring bearer to place hands under and balance it.